I’m kicking off a brand new series on my blog today, my Spa Series! It’s something I have been planning for a while now actually. When I go away I can’t manage to do lots of activities you see. Due to my chronic health issues I can’t do things like water sports, cycling or long walks I struggle to even go on trips out for more than a few hours which can get frustrating. But I’ll tell you what I can do and that’s hit the spa...and I do it very well! I mean it’s all about relaxation & reclining after all plus getting to try out lots of products. I’m hoping to include plenty of the lovely ones local to me in Sussex as well as some in London and further afield too. I decided to choose somewhere particularly special for my first one of the series, in the beautiful Channel Islands! I was over in Jersey with my Mum for a week last month staying at St Brelades Bay Hotel, one of my favourite hotels ever. The Hotel have refurbished their Spa since I visited last year so I was so excited to come back and see what they had done to improve it. The spa day came on our third full day of the trip which was perfect timing for me as day one and two had been quite busy with trips out to places and my pain had been flaring. I had the most wonderfully relaxing day experiencing 3 hours worth of St Brelades Bay Hotel’s Spa Treatments along with a tour around the place by my lovely therapist, Daisy. It’s located on the second floor of the hotel and includes three treatment rooms a nail bar and hair salon. Plus they have a gym and both an indoor and an outdoor pool. There is also a little terrace area for you to sit outside and chill after your treatments. Here is their Spa Brochure if you fancy having a closer look at all the different treatments they offer. The place has been beautifully refurbished including three gorgeous tranquil treatment rooms with a serene misty blue toned décor. I always pay attention to how dark the treatment rooms are. I’ve been in some before that have big windows or leave all the lights on and I think they’re is nothing that makes it harder when you’re trying to relax than bright light or lots of noise. I’m happy to say that these ones where really dark once the treatments started and you couldn’t hear any outside noise or people coming and going. I thought the nail bar was super cute & colourful with choices of OPI & Shellac nail colours and the hair salon is really spacious with glorious views over the hotel gardens. They are also now using products from one of my favourite skincare brands, Caudalie! I post about their products a lot on my Instagram and here on my blog as I just love them! Caudalie use natural ingredients derived from the vines and grapes from vineyards in Bordeaux and the amazing skin benefits they found there. I feel like I’ve been fortunate enough to try a great deal of Caudalie’s range in the past but I actually discovered so many new products that I want to add to my skincare routine now! I’ve even got my Mum hooked on them, especially since having her facial here. She had the Resveratrol Lift Facial and has now got all the products from that range to use everyday! I started with having a Caudalie Fleur De Vigne Candle Massage. As you may know, I have chronic joint pain all over and massages can really help. I tend to like warming massages, with hot stones for example which really help to sooth and relax my muscles and when I read about this one I was so keen to try it! The candle had been burning for a while before my treatment to liquify plenty of it into the oil. It was really a comforting feeling having the warm oil massaged into my skin for my head to my toes! The oil is either poured on directly or the therapist pours it into their hands first, it’s really subtly scented and incredibly moisturising. I felt really good afterwards and I’d definitely have this massage again. Next I had the Premier Cru Facial which is new to this spa & it features Caudalie richest and most luxurious range of products. The Premier Cru range is a bit too rich for my skin type to use on an every day basis but it was a lovely one off treat to supercharge my skin and I do use and love the Premier Cru Eye Cream on a daily basis. Daisy added in a few of the lighter, brightening products from the VinoPerfect range as well which was lovely to try as I hadn’t used any of those before. I was a little apprehensive about the Derma Roller, which is a little tool with sterile micro needles on that is rolled across the skin. However when I saw it the needles were so tiny and short I wasn’t worried! I’ve had so many treatments involving needles like acupuncture this was nothing. You just feel a slight prickly sensation as it’s rolled across your skin a bit like exfoliating! It’s used to naturally regenerate your skin and helps products to penetrate deeper as well as repair acne scars and improve lines and wrinkles. I was so pleased with the results afterwards my skin felt so hydrated & fresh with a real glow. I’ve never seen my skin look that good after a facial before in fact! Shop the Premier Cru range and the VinoPerfect range here. Finally I finished off my pampering session with a luxury pedicure! I always have to have nail polish on my toes in the summer and usually go for a bright colour. I went for Shellac Jelly Bracelet which is a shimmering coral colour. I decided to go for just the regular polish instead of a gel finish though as I find it always lasts a long time on my toes anyway. Daisy organised a really comfortable armchair in one of the treatment rooms to have my pedicure which was really kind. This is the hair salon which is so light and spacious with big windows looking out over they’re beautiful gardens. The terrace area where you can sit outside and have a drink after your treatments. This is the indoor swimming pool which as a whirlpool spa and a fibre optic lit steam room. 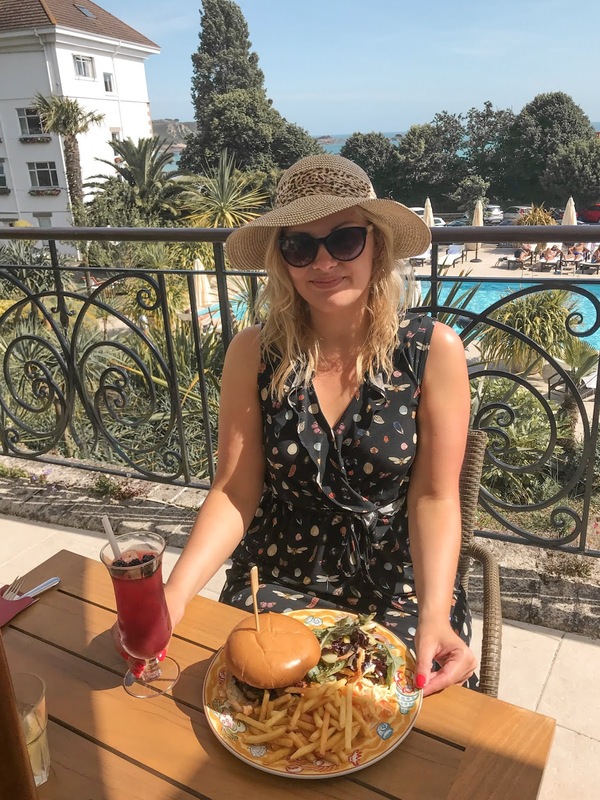 After our lovely spa treatments we had a delicious meal at the Petit Port Café in the sun, this café is in the gardens of the hotel and it so cute! These products here were a lovely surprise waiting for me in our hotel room when we first arrived! Alongside a Caudalie towel there were products from their Des Vignes Collection with included a hand cream, body lotion, shower gel and a hair & body oil. The Des Vignes range has the most stunning fragrance combination of neroli flower, ginger & white musk and the scent will now forever remind me of my holiday in Jersey! I was so impressed with how they had refurbished the Spa at St Brelades Bay Hotel. It looked beautiful and felt really friendly and comfortable. Thank you to Daisy and the team for being so welcoming and giving us the ultimate pampering experience! I’d love to hear about any recent spa days of yours in the comments below and if you have anywhere you would recommend? *I was invited to try out this spa by St Brelades Bay Hotel however all opinions, and love of spa treatments, are my own, please see my Disclaimer for details.